Creativity Camp Update! July 27-30 for Animals Have Feelings Too! Our summer Creativity Camps have been fun filled and busy for all our campers!We've canceled our Theater/Dance: Express Your Inner Cartoon Camp that was scheduled for July 20-23. Join us for "Animals Have Feelings Too" July 27-30! 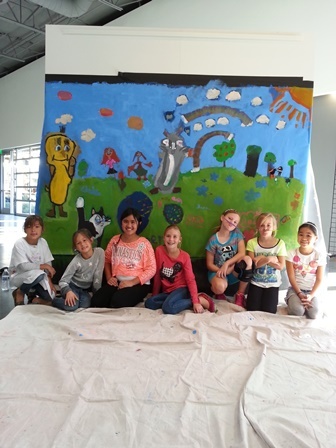 As July comes to an end, the Chuck Jones Center for Creativity is hosting an additional week of our Summer Creativity Camps from July 27th – July 30th! Due to high interest, we are hosting one of our most loved Camps: Animals Have Feelings Too. Your kids will work with our talented teaching artists to enrich their understanding of Color Theory, Modeling, Mixed Media, and Murals. They will find the rich spectrum of color in peacock feathers, intricate designs in the shells of sea turtles, shapes in fish and sea life, and much more! We can’t wait for you to come “Meow! Hiss! Moo! Caw!” with us today and explore all of the fun connections between art and the natural world around us. Details: Drop off by 9:00am, pick up by 1:00pm. No early-morning or late-afternoon childcare will be provided. Bring a snack, water, and brown-bag lunch. You can purchase a lunch from neighboring eateries. Place your order at the time of drop off with cash payment. Dress for a mess!